It’s hard to think of a more simple yet sweet pleasure in life than a good old-fashioned chocolate chip cookie. They’re no doubt one of the most classic sweet treats ever created, and they always taste comforting and satisfying. 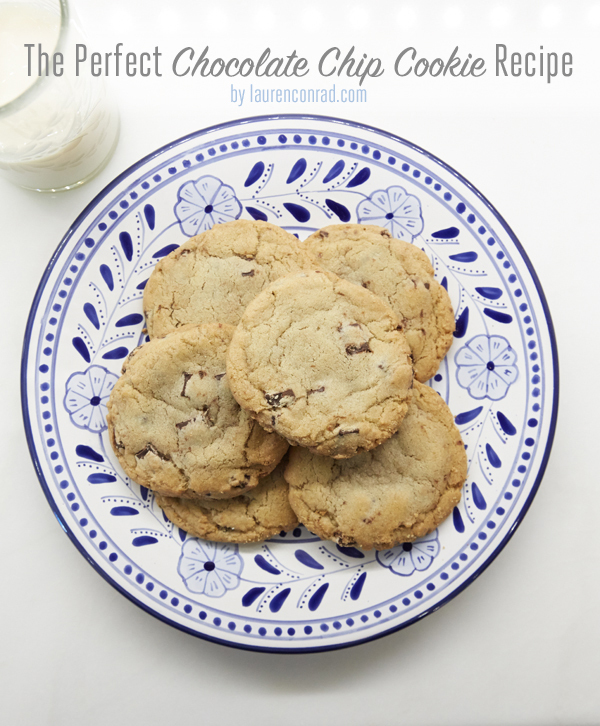 And while many recipes out there are good, the other day I decided to create a recipe for the perfect chocolate chip cookie. I enlisted my good friend and fabulous baker Lauren Lowstan to help me whip up this batch. Aside from a little sprinkle of sea salt to bring out the sweetness, these ingredients are pretty simple. But I do believe that when it comes to chocolate chip cookies, simple tastes just right. Whisk dry ingredients together in a medium sized bowl. Then, melt butter in a saucepan over medium heat. Whisk butter and remove from heat as soon as the butter begins to brown. Transfer the butter to a bowl to prevent burning. Set aside to cool for a few minutes. Beat the butter and sugars until thoroughly blended, about 2 minutes. Beat in the egg, yolk, and vanilla until combined. Add the dry ingredients slowly and beat on low-speed just until combined. Stir in the chocolate chips. If you can, chill your dough for 1 hour. Scoop dough onto baking sheets with an ice cream scoop, and sprinkle sea salt on top. Bake at 350 degrees F, for 7 to 10 minutes. You want the cookies to look under baked in the center, but lightly browned around the outside. Remember, they still cook when you take them out of the oven! 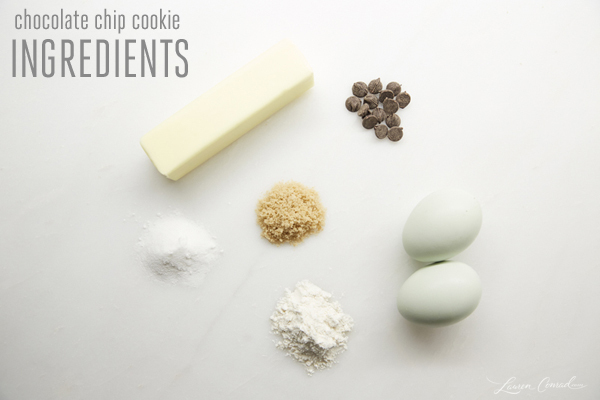 Lauren Lowstan’s Tip: If you want to get the perfect chocolate chip cookies that are crispy on the outside, and soft and chewy on the inside, then refrigerate your dough balls for 24-48 hours before baking. Make sure to bring to room temperature before putting in the oven. This will give your cookies the perfect crispy-to-chewy ratio. If you make sure to follow Lauren’s bonus tip and chill your dough before baking, your cookies really will turn out perfect. And of course, don’t forget to sprinkle on the sea salt! Do you have a secret ingredient you like to add to your favorite recipe? Leave your comments below. I’d love to learn about your recommended recipes. P.S. The plate holding the cookies above is available on TheLittleMarket.com.